The “flowering” of the Beatles’ sound couldn’t have happened during the insane days of wanton, screaming Beatlemania. Who can innovate, when you are four jet-lagged zombies in matching suits and haircuts, struggling in vain to hear yourselves play over a high-pitched, eardrum-splitting din? It wasn’t until the Beatles extracted themselves from their “prison of fame” — as their producer George Martin called it — that John Lennon, Paul McCartney, George Harrison and Ringo Starr were able to, pardon the expression, let their hair down. The closing track, “Tomorrow Never Knows,” is full-on psychedelic, with Lennon sounding like a guy from another dimension, while otherworldly tape loops play over hypnotic drums. “Yellow Submarine,” of course, blossomed into a very psychedelic animated film. “Rain” — which was recorded during the “Revolver” sessions but released as a B-side — featured the Beatles’ first-ever backward lyric, courtesy of Martin. 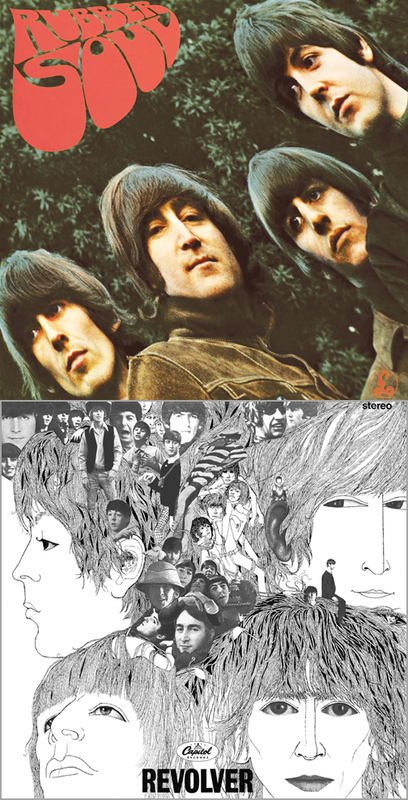 “Revolver” was released on Aug. 5, 1966, one week before the Beatles embarked on a tour that proved to be their last. “On tour, the boys couldn’t even hear themselves play over the screams of the crowd,” said Martin (1926-2016) during a 1999 lecture at the Count Basie Theatre in Red Bank, New Jersey, which I attended. “Every concert sounded like 1,000 jet planes going off. There were no monitors in those days. The Beatles knew they weren’t playing very well. The boys had a very bad case of hotel fatigue. They had grown tired of their prison of fame. They all wanted out. During a hiatus, Lennon wrote the landmark psychedelic song “Strawberry Fields Forever” while in Spain shooting the World War II comedy “How I Won the War” for Richard Lester (director of the Beatles’ films “A Hard Day’s Night” and “Help!”). “The song that started it all was ‘Strawberry Fields Forever,’ ” Martin said during his lecture. 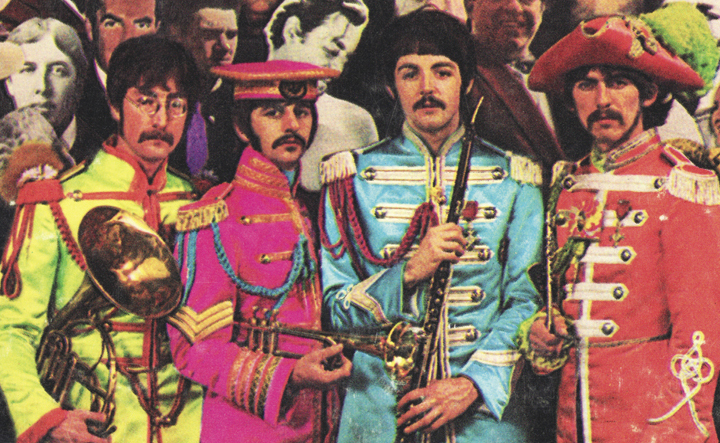 “It immediately demonstrated where the Beatles were at that time. When I first heard it, I was spellbound. ‘Pet Sounds’: Wouldn’t it be nice? 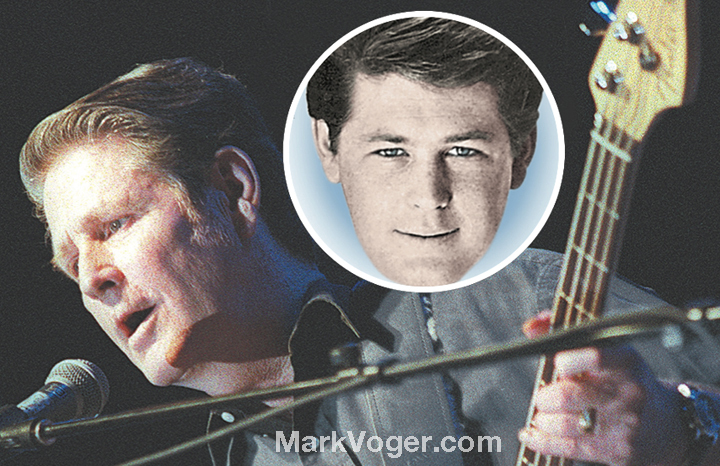 Brian Wilson, the architect of the Beach Boys’ sound, was inspired by the Beatles’ “Rubber Soul” to use innovative instrumentation to craft an album as a cohesive listening experience. To create “Pet Sounds,” Wilson stayed behind while the rest of the Beach Boys — Brian’s brothers Carl and Dennis, his cousin Mike Love, Al Jardine, and Wilson’s replacement Bruce Johnston — went on tour. “Brian was the guy,” Love said. “He left the road in 1965 to devote himself to writing and producing, rather than splitting his time between writing, producing and touring. So Brian was just bursting at the seams, waiting to get into the studio. And that’s what he did. He spent all his time at home, for better and for worse — ‘better’ being musically, at the time, to develop his trade and get in with great musicians and do wonderful tracks. “Obviously, Brian was growing faster than the speed of light,” the newcomer to the group, Johnston, told me in 2002. “I watched a lot of the tracks being recorded. Just listening to the chord changes in the tracks — the way he voiced his chords with the threes and the fives on the bottom — I knew this was way beyond anything that had ever been done in pop music that might be played on the radio. Mick Jagger had a girlie face and full lips, which made him the ideal poster boy for British psychedelia. More so than any of his four contemporaries in the Beatles. Back then — before Jagger’s visage collapsed into “What Ever Happened to Baby Jane” territory — he could wear eyeliner, lipstick and a wizard hat, and still somehow look like a man. 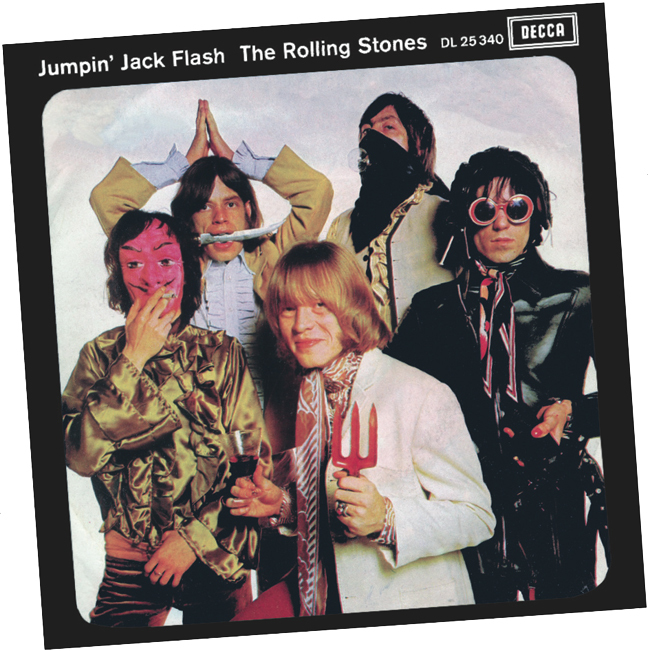 Between the Rolling Stones’ 1966 tour (still a pop band, still playing to screaming girls) and their 1969 tour (Brian Jones gone, all focus on Jagger, evolution into modern Stones complete), the band had its psychedelic period: shortlived, frequent interruptus. The Stones’ 1967 album “Their Satanic Majesties Request” was, like the Beatles’ “Sgt. 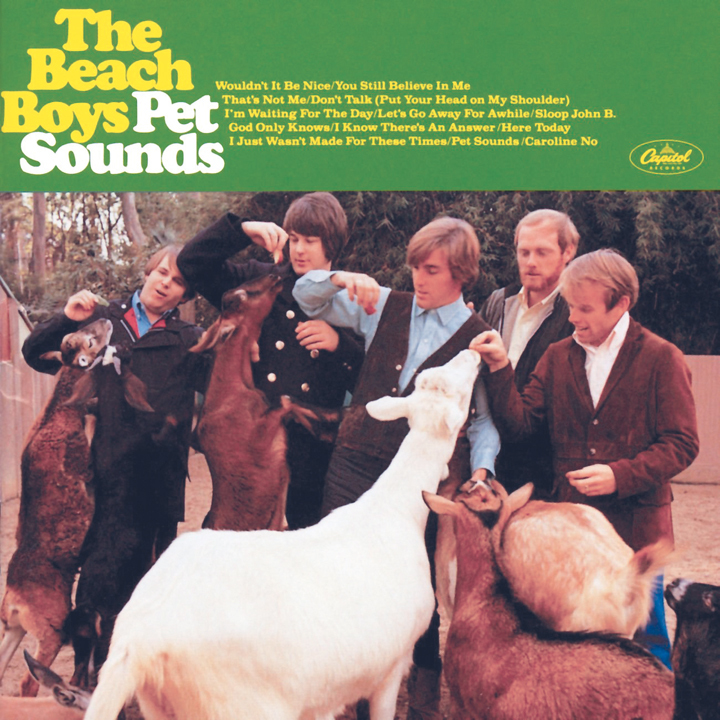 Pepper” and the Beach Boys “Pet Sounds,” a studio-bound project (unlike previous collections that were typically recorded between appearances, schedules permitting). But in the Stones’ case, this was more the result of Jagger and Keith Richards’ drug busts, and the defense against same, than some willful artistic entrenchment. The band had, via necessity wrought by outside forces, slowed down. This did not guarantee wonderful results. 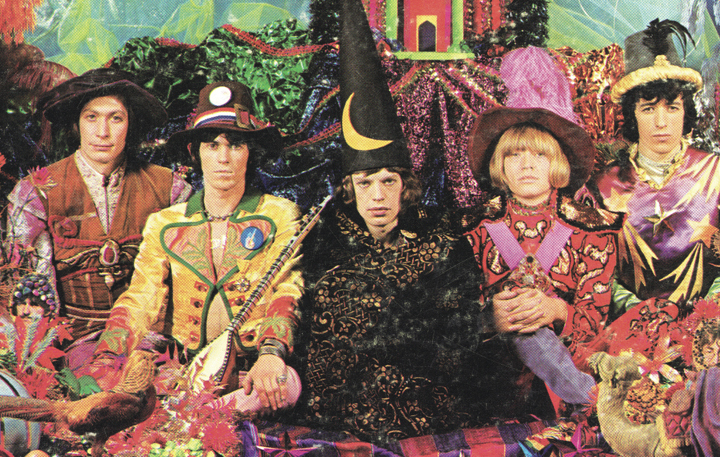 “Satanic Majesties” was no “Sgt. Pepper.” Jones’ deterioration — exacerbated by the awkward Jones-Richards-Anita Pallenberg love triangle — escalated, unchecked. Vitally transitional though it was, this was a messy period for the band. “A sort of dither” is what bassist Bill Wyman said of inter-Stones relations in 1967, when I commented on the metamorphosis that occurred between ’66 and ’69.